From being able to experience a fresh piece of fruit or vegetable just harvested that morning, to supporting the community that you live in, there are multiple reasons to visit your local farmers market. When you shop at your local market, you support not only the local farmers, but the local economy as well. Purchasing from family farms helps them compete in the marketplace largely dominated by huge agribusinesses. When you buy directly from members of your community, you aid in their success and even help preserve and keep farmland in your hometown. 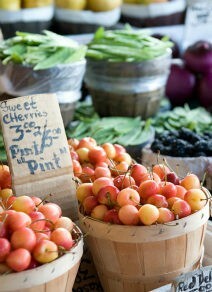 Shopping at a farmers market is one of the best ways to purchase food of which you know the origin. Plus, you also get the opportunity to meet the smiling faces of the people that grew your food! You can ask questions, get to know the farmers, and learn about how the food is grown or where it is produced. And when you purchase from the farms that choose organic and non-GMO, you also promote other farmers following suit. In addition to getting to know the farmers themselves, you can also learn about their animals. If purchasing meat, eggs or dairy products, you can make sure that the farms on which your food is raised treat their animals ethically and with love and care. For those in search of hormone- and antibiotic-free meats or eggs, you are sure to find multiple booths at the market that offer those options. You help to promote the humane and kind treatment of animals by buying products from farms where cows have grazed freely on green grass or chickens have been spared a cramped cage and instead peck about a pasture in search of bugs. Another benefit to visiting your local market is being exposed to multiple options of produce and food products that you may not traditionally see at your local grocery store. From rainbow carrots, to heirloom tomatoes and turkey eggs, you are able to sample different foods otherwise not available to you. It is a great way to be impressed by the farms in your area. Next time you stop in at the Royal Oak Farmers Market with Spot in tow, swing by The Pet Beastro afterward! We’re only a few miles away!